A sampling of a fabulous wine and tapas pairing at Vines Wine Bar and Tapas, located in historic downtown Parker. On the corner of Mainstreet and Victorian Drive, a treasure awaits you. Vines Wine Bar and Tapas is located in the historic district area of Parker. Since 2005, owners Lee and Shari Riggs (both certified sommeliers) have created a quaint, hip, sophisticated, and relaxing getaway. You will always be greeted with a smile by either one of the owners and friendly staff, all of whom hold a wealth of knowledge of the cuisine and wine. The Riggs' love of quality wine, good food and great conversation shows with their tapas style dining and menu. What are tapas, you ask? Tapas come from the Spanish verb tapar, which means to cover, lid, or cork. In the southern regions of Spain, tavern patrons were known to use small pieces of meat or bread to "cover" their sweet drinks from the fruit flies. Today tapas consist of 4 to 6 ounce portions (small plates) to indulge with friends. Usually two or three plates equal a full meal. The tapas are then paired with a wine complimenting the dish. Vines boasts more than 80 different bottles to choose from. The lighter nature of tapas helps to encourage discussion amongst friends and associates. Some tapas to enjoy; their filet medallions, Mediterranean pizza, fonduta fondu, mushroom caps, seafood dynamite and wild mushroom ravioli. For dessert try their crème brulee and the chocolate trilogy. 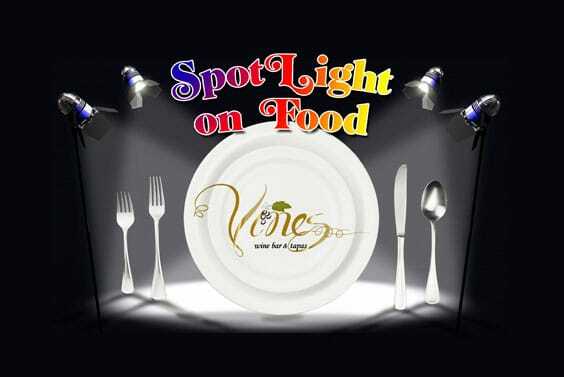 At Vines, being surrounded by character and ambiance are equally important to the quality food and beverage. The handmade tables you are enjoying your tapas on will give you something interesting to talk about as well. Every table is its own unique design and creation with a different theme. It took the Riggs two years to make all the tables for the restaurant, laboring for two months for just one table. 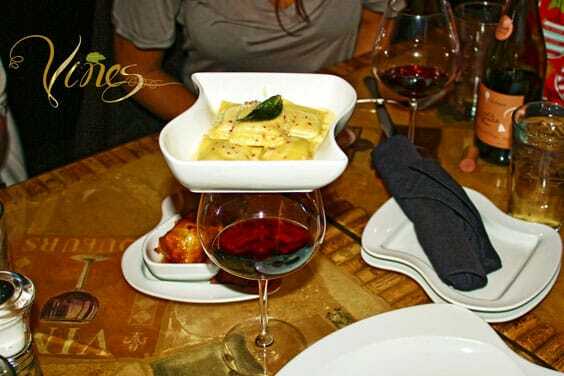 Dine tapas style at Vines for a fabulous date night, girl's night out or just for a relaxing evening. Come join them for happy hour every day from 4 p.m. to 6 p.m. Enjoy half-price wines by the glass. Don't miss thirsty Thursdays or Sundays, which offer half price on select wines. Check out the daily specials like Monday bottomless dips ($10) and Tapas Tuesdays (five tapas for $25). Stop by the wine store located next to the restaurant. It hosts a selection of wines as well as wine gifts and novelties. Not a wine connoisseur? Not to worry, as Vines offers beer, spirits and its own infused vodka for some tasty martinis. Vines Wine Bar is located at 19501 East Mainstreet in Parker - an eight minute drive from Castle Pines via the newly-opened Hess Road extension. Hours of operation are Tuesday through Thursday, 4 p.m. to 11 p.m., Friday and Saturday from 4 p.m. to 1 a.m., and Sunday from 4 p.m. to 9 p.m.. Happy hour runs daily from 4 p.m. to 6 p.m., and Vines is closed on Mondays. www.vineswinebar.com. You may also reach them via e-mail vines@vineswinebar.com.